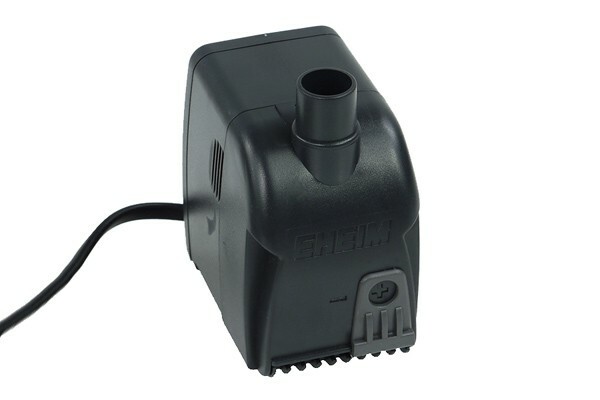 EHEIM compact1000 is the new pump from Eheim for submerged operation. It is suitable for use inside of the reservoir, wehre reliable flow and mixing of the coolant is required. The pump is shipped without an adjusting slide (pump always runs at foll power). Thanks to the compact dimensions, this pump can be installed even in very small spaces. Mounting can be done quickly and easily with suction cups. We recommend using this pump only as a submerged pump in reservoirs. Please note: This pump is shipped without accessories, this mans that no feet are included. Should these be needed, please order Item No 52109 with the pump. Important: This pump must not be connected directly to the PSU! It runs with alternating current, the system PSU provided direct current. For operation of this pump, please order the Alphacool DC/AC converter card (Item No. ) with this pump. Dazu liegen uns von Eheim keine Daten vor.